If you don't have to manage your client's email and their email archiver Acronis works very well. If you're looking for just a backup service for what's on a particular computer then Acronis is perfect. It is easy to use, so newcomers are not overwhelmed with features.It does not include as robust features as Barracuda and Cloudberry, but it does work well as just a backup. If you have servers or client machines that you want to backup, Unitrends is for you. There are newer systems out there with all flash but the UI on Unitrends could not be easier and that is a huge selling point. The ROI is also better than most. They also have a lot of great, free tools that you will benefit from. It's really easy to automate a backup. You can choose where you want the back up to be stored (locally or online) and how frequent you want your backups to be. And then just let it run on schedule. It's very customizable. You can choose what you want to back up, where you want to back it up to and how frequently your backups should run. Recovery is (I have only had to do it once) really fast and smooth. I was able to get back to a working state without calling in for support and all my stuff was right where I expected it to be. It is very reliable. Backups very rarely fail and are easy to fix when they do. Restores are a dream. Select the day, select the content and restore. Couldn't be easier. Has 4 NIC ports that you can aggregate for more throughput. The UI is very simple to work with. They updated it recently and it is even simpler. You don't have to fumble through a menu. Everything is in front of you and laid out logically. While there are a lot of various reports available there is still room for improvement, especially when trying to understand the usage of the file system storage, a drill down into each client's backup and archive data would be beneficial. The ability to grow the capacity of the appliance via drive upgrades, within reason, would alleviate the need to do appliance swaps or add additional appliances, even if there was an incremental adjustment to the support costs. For someone like ourselves who, because of legislation, do not have the ability to use external cloud services having the ability to use an internal self-hosted cloud or NAS/SAN for long-term historical archiving would be more than welcomed. I am 100% likely to renew my Unitrends support and keep my appliance. 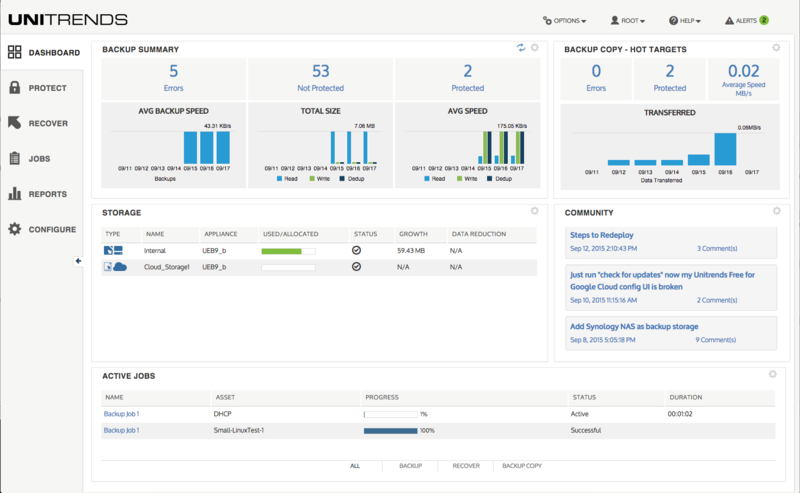 I don't see any products that have come close to being able to do the on-prem and cloud backups with the ease of Unitrends. This is a great tool and I can't imagine someone wanting to implement anything else. I have never used such an easy product that is stable and scalable like Unitrends. I have been running backups for MANY years. On premise, tape, disk, cloud, you name it. Unitrends is very flexible, stable and has incredible reporting features. It's nice when management requests a report and it takes you 5 minutes to run it and dump it to PDF. How can you beat that? Until dealing with Unitrends support, I have NEVER in 25 years of IT, dealt with technical staff that can actually SOLVE your problem the first time!! It's incredible if you ask me! The technical staff at Unitrends is by far the best! Acronis does not slow your system down when running backups as Symantec did. Some people have an issue with CPU's being impacted but overall it's not an issue. It took me exactly 1 year from the time I first saw unitrends till the day we made the purchase. I selected Unitrends for one reason and one reason only. It works every single time. Simple, easy to use, amazing support. We have found that this was a much more cost-effective solution than our Symantec platform. The fact we could purchase a single VM 'host' license meant that we could back up every VM on that host - irrespective of how many VMs there were. The backup management can now be administered centrally - this allows easy remote access from technicians from anywhere within our business. Separate and distinct users can also be configured to add a much needed security layer to the backup management process. This was lacking in the previous Symantec model we had. Since moving to Unitrends, our backups have been more reliable than they ever were with Backup Exec. Unitrends has given us the ability to do hourly backups of our file servers. Users that request file restores have really appreciated the granularity of recovery that I'm able to provide them. Unitrends allowed us to consolidate our backup solutions (previously we were using one application for physical and one for virtual backups), which makes the management of backups and restores much more streamlined.